Welcome to the fourth edition of Coral Sea News for 2018. As a direct result of our last expedition to PNG, funded by your donations, we are very pleased to announce the creation of the Nua Marine Reserve Network in the waters of East Ferguson Island in the Milne Bay Province! “Nua” means Coral in the local Dobu language, and this area of the Eastern Coral Triangle contains some of the most biodiverse coral reef ecosystems in the world. Our surveys last month revealed they are still in excellent condition with no damage from recent bleaching events. I have spent thousands of hours underwater in my career, and the reefs I saw in the Nua Network had me saying “WOW” into my snorkel on more than one occasion! On behalf of myself, my team, and all the people in our partner villages at Ferguson Island, I just wanted to say a huge THANK-YOU to everyone that has supported the Foundation over the last two years, it is your generosity that has directly led to this expedition and amazing result we have achieved here. Conservation of the high-biodiversity reefs of the Eastern Coral Triangle is now recognised as a global priority, and we were able to do some ground-breaking work in a remote area of PNG to support this initiative, secure fisheries resources for the local people, and create ecotourism assets of an exceptionally high quality. I’m absolutely thrilled with the outcome, and I will share some more details of the expedition below. Our voyage was several months in the planning, and after flying into Alotau from Port Moresby, we loaded 400L fuel into a 23ft longboat and travelled 100km by sea through the Milne Bay province to Sebutuia Bay of Ferguson Island, which is the home of our trainee Lorie Pipiga and the extended Pipiga Family. This journey took 5 hours and the scenery was absolutely stunning the whole way, leaving Milne Bay with the Islands of the Louisiades in the distance, and then turning north to traverse the coast of Normanby Island with its brooding mountaintops shrouded in cloud. Rounding the north tip or Normanby Island we entered the still waters of Gomwa Bay and then into the blue Sanaroa Channel to arrive at Sebutuia Bay just on sunset. We received a very warm welcome from the Pipiga Family, and I was speechless when told that a new house had been built for me as a gesture of thankfulness for the help that the Foundation has afforded the family over the years. With giant rainforest trees and a freshwater stream behind, and the blue waters of Sebutuia Bay in front, I felt like I had walked into a tropical paradise! Someone must have heard my secret wishes for the ideal tropical hideaway……complete with junglefowl! Our team got straight to work, and over the next 9 days we held landowner meetings at Ferguson, Sanaroa, and Uama Islands to explain the benefits of the marine reserve concept and invite the local people to participate with the support and assistance of the Coral Sea Foundation. All the community leaders had their chance to speak, and I was overwhelmed at the positive response we got in all the villages. Everyone knew the fish catches had been going down over time, and they were keen to support any initiative that would help conserve the resource into the future and provide them with assets they could use to promote ecotourism. We were very lucky to have PNG’s former High Commissioner to Indonesia, Jeffrey Tolo’ube, come and speak at our meetings, as he is a Ferguson local, a fluent Dobu speaker, and a passionate advocate for sustainable resource use in PNG. He was able to translate the logic of marine reserves into Dobu so we were able to get the message across very clearly, and there were grown men in tears as they realised they had to work smarter to manage their resources and give their kids a future. At the end of the main meeting, we had 5 different landowner groups pledge reef to the new Nua Marine Reserve Network, and we jumped straight into the longboat with the leaders and the GPS to map the sites. This was essential, as we established exactly which bits of reef they were talking about, and all the leaders could see where each other’s protected reefs were located. A great day’s work by all involved and a fantastic outcome! We also conducted site assessment surveys on all the designated reefs and collected more than one thousand monitoring images. In the last few days we have compiled the whole package of information and delivered it to the Conservation and Environment Protection Authority of the PNG Government for formal recognition of the Nua Marine Reserve Network as a Locally Managed Marine Area (LMMA). The CEPA people were very happy to receive it as they are working on a national project to document the marine protected areas of the country to meet their Convention on Biodiversity targets, and they thanked us profusely for the assistance we were giving the local communities in this area and the valuable monitoring data. To say I was thrilled with this outcome would be a major understatement! The jewel in the crown of the reserve network is the Lalai reef on Ferguson Island, which I discovered in 2006 while working on True North, and over the years I have managed to get back to this reef every single year and collect a set of monitoring images while guiding the True North guests over the spectacular coral gardens. It remains one of the most incredible reefs I have ever seen in any of my travels right around the Indo-Pacific, and the day after the meeting I swam for two hours over Lalai absolutely blown away by the condition of the corals and the fact that the landowners had all just agreed to preserve this incredible spot! To put the cream on the cake, we were able to survey a whole lot of other reefs in the local area that I had never had time to visit before, including Uama and Sanaroa Islands, and we found beautiful bays with fantastic coral communities and amazing potential for snorkelling and diving nearly everywhere we went! The whole area has such incredible ecotourism potential, in addition to the coral reefs there are 2km high mountains, lush tropical rainforests complete with waterfalls and endemic birds of paradise, fascinating indigenous cultures, and we even found a wave and a blue lagoon for the surfers and kiters. I’m hopeful that we have started the ball rolling in this region and the local people can halt the decline in their fisheries and start to generate sustainable ecotourism income, as the pressures from Asian logging and commercial fishing companies are a real and present danger to the natural assets of this area, and we have seen only too often the damage they cause in Sebutuia Bay and elsewhere in Melanesia. There is plenty of work to be done now to capitalise on the success of this first expedition. The PNG government does not have any resources to help these remote areas, so it is up to us to support the local people in their aspirations for marine conservation. 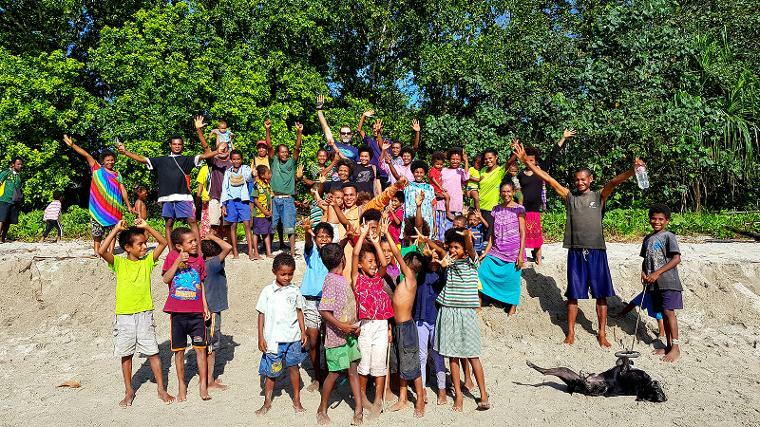 The Coral Sea Foundation’s assistance platform in Melanesia is based around marine reserve creation, clean water, medical aid, and education, and it is very important that the local people quickly see some benefit coming back into their communities from their participation in the marine reserve program. They need clean water and basic medical supplies as a matter of priority, and assistance to create signposts for the reserve reefs, and we need plenty of leaflets and posters distributed to all the villages so that people are aware of the existence of the Nua Marine Reserve Network and can modify their fishing locations accordingly. Can you imagine living in a jungle village with no first aid supplies at all? Not even a band-aid or a panadol tablet? This is the day-to-day reality for the people in these villages. About one third of kids have infected cuts on their legs, many people have full body fungal infections, and the old people have no analgesics for the pain of arthritis. The nearest medical outpost is a 15km walk away through a muddy rainforest track, so I was running daily first aid clinics in the coastal communities to attend the most pressing problems, and the people were so grateful. Basic medical supplies that we can buy over the counter in Australia, such as band aids, wound dressings, antiseptic creams, antifungal creams, panadol, and arthritis balms, made a huge difference to the health and happiness of the local people, especially the young kids and the elderly. We are very grateful that our partners at Solutions 4 Health Australia provided us with medicinal Oil of Oregano to distribute to the people, and we could see very positive results in the 10 days we were on site. The oil has amazing antibacterial properties and is a great overall health tonic, and the local Christian people were very happy to have received the medication which has biblical links to the Hysop used to cure people by Jesus Christ! With Foundation funds, we were able to purchase another package of medical supplies in Alotau to send back to the villages, and this will be an ongoing requirement. Some villages have good clean spring or stream water for drinking and washing, but others are located on hot volcanic ground with geologically contaminated freshwater supplies, so getting some clean water into these places is a major priority. We purchased materials in Alotau to fix the guttering and a hole in the 40KL school water tank at O’oya village, so that should bring some relief to this community soon, but realistically we could use another 4 or 5 water tanks in this area to improve the health and livelihood of the people. 9,000L poly tanks can be purchased from the hardware store in Alotau for only A$2,500 and can be delivered to the Island by coastal freighter. We are developing a partnership with the Conflict Islands Conservation Initiative and they will make their supply vessel available to do a run from Alotau to deliver large items like water tanks and roofing materials. This will be very helpful, and it means we can get that water security into the area quite effectively, so raising funds to purchase the equipment is now a priority. Educating the local population about their coral reefs and the animals that live there is also a very important job, as it increases their pride and sense of ownership over their marine reserves. I was able to show the people some video that I had collected from their reefs, and they were absolutely fascinated and brought to tears by the beauty of an underwater world that most of them had never seen before. We are hoping to get some coral reef field guides and info posters into the schools and deliver several sets of snorkelling gear into the area so that a knowledge of the reef can be cultivated in the younger kids, and they can take part in the monitoring activities themselves. Many of you have donated to support the Foundation in the past, and I’m hopeful that you may be able to contribute again to get the Nua Marine Reserve Network up and running successfully. I have created a new funding portal, and you can be assured that all donations will go directly into supporting the Nua reserves and the local communities, through assistance with monitoring, education, clean water, and medical aid. Even a few dollars can buy Band-Aids to help the children, so if conserving the most outstanding coral reefs in the world and helping the people that rely on those reefs to enjoy a better quality of life is something that you care about, we would greatly appreciate your support! I will be returning to the area as soon as possible to continue the important work up there, and my house at Sebutuia will be available for use as a base for eco-travellers from October onwards. True North visits the area each December, and other vessel options are also available on request. I would encourage all of you to see the area for yourselves! Please share the news about the creation of the Nua Marine Reserve Network across your social media platforms and keep an eye out for our next edition of Coral Sea Visions, which will feature a stunning video production based on material collected during the expedition. On my way through Port Moresby I was able to hold meetings with our Sea Women of Melanesia supporters in PNG and bring them up to date on the activities of the Foundation and the opportunities for training. It was extremely heartening to see the passion and enthusiasm for marine conservation work in this group of intelligent young women, many of whom have recently graduated from UPNG with biology degrees and are now searching for meaningful work..
We identified the high-priority areas of PNG that we want to target in our marine reserve development program, and we are exploring options for running a group training program in PNG for these women so that it is cost-effective for them to participate and build their skills. These women can then go out into the islands and spread the Marine Reserve gospel, laying the groundwork for the type of the work we just completed at Ferguson Island. Planning is already underway for our next female-led expedition, which will take us to a secret location in the Manus province, so stay tuned for more exciting news soon! Our funding portal for this program remains open, and it remains an essential part of our development program at the Foundation. Thanks to the flexibility of our Red Bubble online system, we are able to print and deliver an incredible range of high quality art-work and practical merchandise that features some of the beautiful imagery from the Coral Sea and the Foundation logo. We have been testing the shirts, tote bags, and coffee cups over the last few months and are very happy with the quality and durability, and of course the fine art prints remain exceptionally well made and finished. We have an extensive collection of hundreds of images in the portfolio and they can be printed onto anything from a postcard to a calendar or a framed art print, and of course all proceeds from the sales go back into our training and marine reserve development programs. Please view the collection here and let us know if we can help with any aspect of image selection or product creation. Thanks again for your support and interest in the work we are doing at the Coral Sea Foundation, it has been very rewarding to put our program into action and see such incredible results! The Foundation is getting more widely noticed and we are developing partnership collaborations across government departments, NGO’s and private corporations, so there are exciting times ahead and lots more important work to do. Please follow us on our social media sites for regular updates on our activities, with lots of stunning imagery and video still to come, and please share our Mission as widely as possible across your social media networks, as the power of the message is amplified by every new person that hears our story. Please feel free to call in and say Hi if you are in North Queensland and would like to enjoy the beautiful reefs and beaches of our Magnetic Island. Best wishes From Dr Andy Lewis and the Coral Sea Foundation team. Previous editions of Coral Sea News.